India is a melting pot of races and religions. Every religion has its own unique style of celebration. But Diwali (Deepawali), the Festival of Light, is celebrated with fervor and gaiety among all races and religions. The festival symbolizes unity in diversity. The celebration of this five-day festival commences on Aswayuja Bahula Chaturdasi and ends on Kartika Shudda Vijiya. Hindus all over the world celebrate Deepawali with great enthusiasm. This is a major Hindu festival honouring Mother Lakshmi – the goddess of wealth. Diwali is a holy tradition, not to be put in the shade. It symbolizes the victory of light over darkness; darkness refers to ignorance and light refers to knowledge. Celebrated joyously all over India, it is a festival of wealth and prosperity. Deepavali is celebrated 20 days after Dussehra, on Amavasya - the 15th day of the dark fortnight of the Hindu month of Ashwin (Aasho) in (Oct/ Nov) every year. Diwali is a festival synonymous with celebrations in India and is an occasion for jubilation and togetherness. This is an occasion for people of all religions. At the metaphysical level, Deepawali is a festival signifying the victory of good over evil. People believe that the latter is destroyed and reduced to ashes by fireworks. This festival is celebrated on a grand scale in almost all regions of India and is looked upon mainly as the beginning of a New Year. On this day of Diwali (Deepavali) people light small oil lamps (called diyas) and place them around their homes, in courtyards, gardens, verandahs, on the walls and also on the roof tops. In cities, candles are substituted by diyas; and among the riches, candles are made to substitute for fashionable lights. The celebration of the festival is customarily accompanied by the exchange of sweets and lighting crackers. On the night of Diwali, all the shops & offices are decorated with electrical bulbs of various colors. They are filled to capacity in this festive season. People visit their friends and relatives and present them sweets. Many people make "rangoli" inside & outside their house. Rangoli is a pattern which is made on the floor, normally by coloured powder, but in the house it is made with paint. In the evening the family prays to Laskmi, the goddess of wealth. Then people put diyas (oil lamps) all around the house. About 8.00 pm the fireworks start. This is the time when the whole country is lit up and fireworks continue uptill midnight. 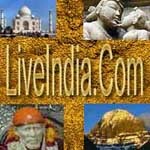 In north India, Deepavali is celebrated as an auspicious occasion of Rama's homecoming from fourteen years of exile and also after defeating Ravana and his coronation as king; In Gujarat, the festival is celebrated to honour goddess Lakshmi, the goddess of wealth; and in Bengal, it is related with goddess Kali. Everywhere it is celebrated with the same spirit and signifies the renewal of life. Diwali is also celebrated outside India mainly in Britain, U.S.A., Guyana, Fiji, Malaysia, Nepal, Mauritius, Myanmar, Singapore, Srilanka, Trinidad and Tobago, Indonesia, Japan, Thailand, Africa, and Australia among the Hindus world over. Whatever may be the legend behind the festival but people celebrate it with great enthusiasm. In this festive season people exchange sweets, wear new clothes and buy precious items for celebration and enjoyment. You must take a bath, and wear new, or at least clean, clothes, before starting to arrange for the actualceremony. The yajamana, should sit facing the east if the icon faces the west (purvabhimukham upaviseva). If the icon faces the east, you should sit facing the west (pascimabhimukham upaviseva). This is a pot in the shape of an expanded vase (a lotacan be used in place of Kalash). Place water inside the Kalash. Place thebunch of 5 or 5 Mango Leaves inside the neck and place a saucer of rice ontop of the Kalash. (This Saucer represents the MOON). Place One big diya,filled with ghee, on the plate of rice resting on top of the Kalash (this represents THE SUN). Together they represent MAHA LAXMI. It is customary to setthe pot on some grains of unbroken rice. This pot represents Varuna, the God ofthe Ocean. AND LAXMI as Mother Earth. Place the other big diya on your right hands side -this one is for arti the wicks should be of the rolled up type. Another diya should be kept on the side next to Ganesh. This can be a small one, with apulled up wick. This is for the purpose of performing arati later on. It should be placed on a small platter or tari on some rice. Place a lower platform before the one on which the icons and the big diyas are placed. The red cloth should be spread on thislower platform. Now fill the other 8 (diyas) with ghee and wicks and place them around the Kalash in a Half circle with the circle towards you. Each diya is placed on a rice platform. Gouri, Padma, Saci, Medha, Savitri, Vijaya, Jaya,Devasena, Svadha, Svaha, Mataro,Lokamatrah, Hrstih, Pustistatha, Tusti, Atmakuladevataare the sixteen venerable mothers. Take a handful of rice, and pouring it through yourfingers on the red cloth. This is the representation for various deities as explained below: Sprinkle the flowers, rice and fragrance (atar). It is only now that Laxmi herself gets worshipped.Start on this confidently and happily. Aum Namaste-astu mahaa-maaye sree peethe sur-poojite,Shankha chakra gaddaa-haste, Mahaa Lakshmi namo-astute. O Great Mother, abode of fortune, Who artworshipped by the Devas, I salute Thee; O Mahaa Laxmi, wielder of conch,disc and mace, obeisance to Thee. Aum Namaste garu-daaroode, kolaa-sura bhayankari;Sarva paapa hare devi, Mahaa Lakshmi namo-astute. My salutations to Thee, Who ridest the Garuda andart a terror to the demon Kola; O Mahaa Laxmi remover of all miseries, myobeisance to Thee. Aum Sarvagye sarva varde, sarva dustha bhayankari;Sarva duhkha hare devi, Mahaa Laxmi namo-astute. Salutations to Thee, Who knowest all, The Giver of all boons, a terror to all the wicked, remover of all sorrow, my obscene to Thee. Aum siddhi buddhi prade devi. bhukti-muktipradaayini; Mantra moorte sadaa devi, Mahaa Laxmi namo astute. O Goddess of Wealth, giver of intelligence andsuccess and of worldly enjoyment and liberation, Thou hast always the mystic symbols as Thy forms, O Mahaa Laxmi, obeisance to Thee. Aum Aadhyanta rahite devi, aadhya-shakte maheshvari;Yogaje yoga-sambhoote, Mahaa Lakshmi namo-astute. O Mother Maheshvari, without a beginning or anend; O Primeval Energy, born of Yoga; O Mahaa Laxmi, obeisance to Thee. Aum Stoola suksham mahaa rovdre, mahaa shaktemahodaye; Mahaa paapa hare devi, Mahaa Laxmi namo-astute. O Mahaa Laxmi, who art both gross and subtle,most terrible, great power, great prosperity and great remover of allsins, obeisance to Thee. Aum Padmaa sanas-thite devi, pare brahma svaroopini;Para meshi jagan-maatar, Mahaa Laxmi namo-astute. O Devi, seated on the lotus, who art The SupremeBrahman, The Great Lord and Mother of the Universe, O Mahaa Lakshmi, obeisanceto Thee. Aum Svetaambar dhare devi, naanaa lankaar bhooshite;Jagat stithte jagan maatar, Mahaa Laxmi namo-astute. O Devi, robed in white garments, and decked invarious kinds of ornaments, Thou art The Mother of the Universe and its support;O Mahaa Laxmi, obeisance to Thee. Aum Mahaa Laksham-yashtak stotram, yahahpathed-bhakti maan narah; Sarva siddhim vaapnoti, Mahaa Lakshmee prasaad taha. Whoever with devotion recite this hymn to SriMahaa Laxmi, composed in eight stanzas, attains all success through the Grace ofMahaa Laxmi Devi. Laksmi who is seated on a lotus, has eyes as wideas lotus petals, massive hips, deep navel, and heave breasts, wears white upperand lower garments, wears jewelry, is bathed from a golden pitcher, carries alotus in her hand, and is associated with every auspicious sign, let her residein my house. Drop the flowers and the rice at the feet of the goddess. I invoke the mother of the three worlds, the three eyed one with the spear in her hand, in whom all the gods reside. I invoke the goddess. We worship the kalasha (vessel above which the coconut is placed) invoking Mahavishnu at the mouth of the vessel. We invokeLord Rudra (an aspect of Shiva) at the neck of the kalasha and Brahma at thebase of the vessel. We invoke the Universal Mother Goddess and Her retinue in midst of the kalasha. Thus the male and female trinities are invoked. Salutations! AUM AAJIGHRI KALASHAM MAHYAATVAA-VINSHATVINDAVAHPUNROOJEE-NIVARTASYA SAANAH; SAHASRAMDHUKSHVORU-DHAARAAPAYASVATEE PUNARMAA VISHATAA-DRIYAH. AUM ATRA GANESH VARUNA GAURYA AADI KALSHAA DHISHTITDEVATAASARVEIHAAGACHCHANTU IHA TISHTANTU SUPREETAA VARDAA BHAVANTU.ITI KALASHPRATISHTAA SRI KALASH STHAAPYA SRI KALASH DEVATAA SRIVARUNA DEVATAAYEBHYO NAMAH. BRIHASPATI PRASOO TAAS TAA NO MUNCHAN TVA GVANG HASAH. TAN DHEERAASAHA KAVAYA UNAYANTI SVAADHYOMANASAADEVAYANTIH. Invoking all the places of pilgrimage in thispot, I worship it and bow to it. 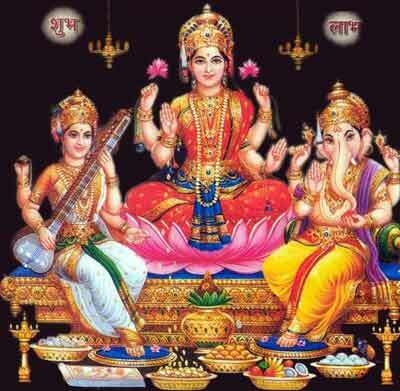 NOW THE NINE FORMS OF LAXMI ARE WORSHIPED - THE 8DIYAS AND THE ONEIN THE MIDDLE KNOWN AS MAHALAXMI. Recite Mahalaxmi Bhajan & Aarti after performing this. What is the meaning of Diwali or Deepawali? Diwali is the common term used throughout India to denote this holy- day, but people in South India commonly use the word, Deepawali. Diwali comes from the Sanskrit "Deepawali"-Deepa meaning light, wali meaning row, hence row of lights. Or as otherwise known, festival of lights. People will light 'diyas' or lights of oil, or oil lamps. This is done by using a small brass plates or tiered plates as a lamp and putting oil or ghee (clarified butter) in the plates and putting wick and burning it. 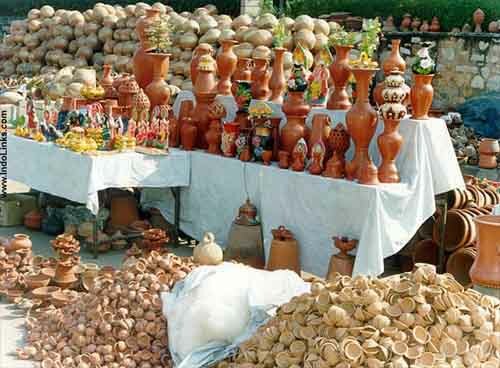 Here you can see some pictures of different types of Indian oil lamps. People will light these every morning for puja, and keep lit all day and night through out Diwali. How do people celebrate Diwali in India? Diwali is the greatest festival. It is celebrated all over India, except by a majority of Malayalees (persons from the state of Kerala). That is because Malayalees celebrate Onam. That is a different festival special to Kerala state. People ready themselves for Diwali sometimes months in advance. 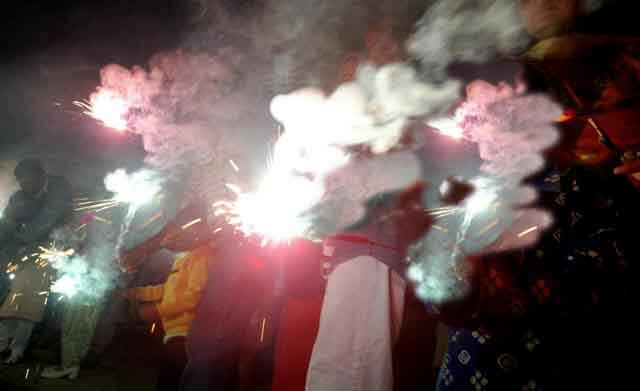 The firecrackers (not big ones like westerners see for new years, etc, but small hand held types) begin a month in advance, and nearer to Diwali it is not even possible to think or walk outside without them being burst. (In fact one Diwali when I went to my friends house, a cracker was thrown on the road near to us, hence, it is usually unadvisable to go out on this night, due to these problems.) Diwali is like Christmas for westerners. Diwali means celebration. The pujas (prayers) go on for a week or more, but due to modern times, only one to two days is given for holiday for Diwali. What can I do for my Indian friends to show my appreciation and celebrate Diwali with them? In India, a common practice is to buy new clothes and present them on Diwali to the person you are giving them to. It doesn't have to be "Indian" clothes, it can be whatever the person likes. It doesn't need to be wrapped. If you want to present it in a holy way, dab your finger in turmeric and place this on the corners of the folds of the garment. It may stain, so it is usually placed on bottom hems. If presenting the gift to elderly Indians, it is a good idea to bend down on your knees and touch their feet with your hands. In addition, offer the gift in the right hand with left hand on the bottom or do not use the left hand. Usually, Indians in US won't take offense to the use of the left hand, since they know the customs here, but in India that is not always the case. Other nice offerings on Diwali are sweets, jewelry, or other household fabrics like towels, linens or blankets. In India, Diwali is very commercialized, people spend lots of money on buying new dresses, saris, salvaar kamiz, pavada davani (skirt and top), lengha, dhotis, kurta pajama, etc for the girls and boys, men and women. People even buy new gifts for the newlyweds. Diwali is traditionally a time that the newlyweds come to their inlaws, in particular the newlyweds go to the bride's family home to collect gifts, including relatively inexpensive gifts from sweets and clothes to very expensive gifts like gold, cars and even land and property. What are some religious aspects of Diwali? Though I understand that Diwali is celebrated differently in different parts of India, traditions can span all over India. It is generalized that people in South India usually take oil baths in the morning. Puja in South India is more associated with Laksmi, while in North India Puja is more associated with Ram (to have returned to Ayodhya) or with Goddess Kali. However, on Diwali day, families wake up at 4am all over India.